Preheat an oven to 400 degrees F (200 degrees C). Whisk the flour, baking powder, and salt together in a small bowl; set aside. Beat the eggs in a mixing bowl until smooth. Whisk in the flour mixture until no lumps remain. Stir in the Colby-Monterey Jack cheese, cottage cheese, spinach, green chiles, and melted butter until evenly blended. Pour into pie crust. 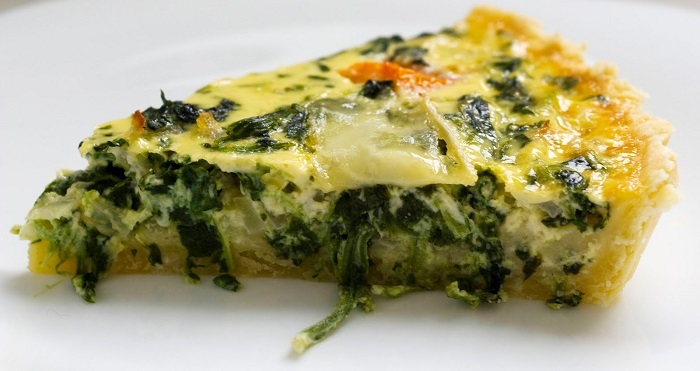 Bake the quiche in the preheated oven for 15 minutes at 400 degrees F (200 degrees C), then reduce the temperature to 350 degrees F (175 degrees C). Continue baking until the quiche is slightly browned and a knife inserted into the center comes out clean, 35 to 40 minutes.